“There is no doubt that there is a special bond shared among those passionate about cigars” – AJ Fernandez. For hundreds of years, cigar smokers from around the world have been utilizing this special hobby as a way of not only relaxing, but as a way of community. Cigar smoking is about not only enjoying a great cigar, but great company as well. 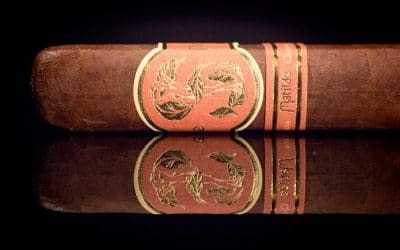 Now, the word Enclave may be one of the best cigar names I have ever heard. Enclave means, “A country entirely or mostly surrounded by the territory of another country.” For cigar smokers, this basically means—no matter where we come from around the cigar world, inside it, we are all a part of the same enclave. Last year’s New World release paid homage to a time of colonial exploration. This year, the Enclave pays respect to the Native American culture, and the deep roots that tobacco planted between the nations. The presentation of the Enclave is fantastic. The band is very western, boasting lots of color and an image of an Indian riding a horse surrounded by English currency, along with blue and gold engraving. Looking at the tobacco of the cigar, a very rustic looking, dry, brown wrapper covers the cigar’s salomon shape. No visible tooth or veins, but there are quite a few seams of the wrapper coming undone. The cold draw brings forth a subtle sweetness, but nothing more. A very nice cedar and hay aroma begins to fill the air during the toasting. On the first draw, a buttery sweet tobacco and graham cracker burst forth. With the figurado shape, there is always an initial blast of flavor in the beginning, where the ring gauge is smaller on the foot. This blast of flavor was simply delicious! I found myself salivating over the thick, creamy smoke and soon wished the entire cigar was a 30 ring gauge. Into the first third, the cigar quickly mellowed out. With the normal 52 ring gauge, there was no more full-body flavors, settling for a medium body. Butter and sweet toast make up the majority of the profile, along with graham cracker, faint chocolate, black pepper, and cedar and spice on the retro-hale. Around the halfway point, the cigar’s first ash fell. It held on nice and tight almost halfway, but after losing the foot, the Enclave never held on more than a half inch after that. Buttery sweetness still controlled the palate at this point, and the retro-hale lost most of the cedar—leaving just a general black pepper and subtle spice. Down to the nub, the flavors remained the same. The graham cracker and toast flavors came back with the added heat, also creating a walnut and pecan contour. The smoke developed a very rich and chewy texture. The overall flavor was the general, sweet tobacco however, just barely leaving hints of butter and cedar. Yes. Although the initial blast of flavor from the figurado shape created a huge longing that the rest of the cigar could never live up to, it still produced top-quality flavors of delicious tobacco, right down to the nub. And with the very affordable price point, that’s more than I (and most others) could ask for. All around, the Enclave is a genuinely tasty cigar. True, the cigar could never live up to its first minute of full-force flavor, thanks to the figurado shape—but it still kept the same great smoke throughout. The Enclave is a historic experience, reminiscing the age of tobacco, from its roots, to the very circles of friends we have today.